Above can be seen two photographs of the same icon of the Archangel Michael from the Monastery that honors his name in the village of Mantamados in Lesvos. But there is a very big difference between the two! In the top photo of the Archangel his mouth is open, while in the bottom photo his mouth is closed just as can be seen daily when pilgrims visit to venerate it in the sacred church. What happened? 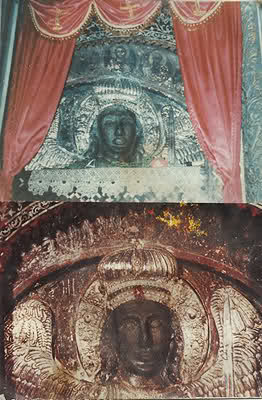 The top photo was taken about twenty years ago by a pilgrim who went to venerate the icon. As he was waiting in line for his turn, which can be experienced on a daily basis due to the large crowds, a woman in front of him was praying with tears in her eyes to the holy Archangel to help her with a certain problem she was going through. Suddenly all the attendees were amazed when they saw the mouth of the Archangel open as if he was speaking to her. The above mentioned pilgrim, since he had a photo camera with him, immortalized this shocking event with a snapshot. It was an awesome miracle of the Archangel that shocked all the bystanding pilgrims, and it continues to shock all those who see the photo and hear about the miracle. This holy icon of the Archangel Michael of Mantamados is embossed, made of earth and the blood of monks slaughtered by pirates during a raid and plunder of the Monastery, made in the image of the Archangel as was seen in a vision by the only surviving monk. This dual photograph was given to me by a good friend and brother in Christ, John Kampouropoulos, a Pharmacist by profession in Athens who is a native of Mytilene. When he moved to Valyra in 1994, this photograph disappeared in his packages of files and books. Despite my frustrating efforts to find it, it became impossible to find. Suddenly a few days ago, on the feast of the Holy Archangels Michael, Gabriel and Raphael, it was found in a place I did not expect to find it, right in front of me! Chance? Let everyone interpret this as they like. That which interests me is to make known this wonderful event to all: believers, unbelievers and to "actors" of atheism.